One the most exciting things to happen over the Christmas and New Year break was that I can across some great new epic fantasy. A new author discovery for me! Miles Cameron’s The Red Knight. I could not say that Cameron is necessarily a new author. Cameron, who also writes under the pen name of Gorden Kent, has published a substantial body of historical fiction, as well as series of espionage thrillers, but he was certainly new to me as a fantasy author when I got hold of a copy of The Red Knight. Every now and then an author comes along that makes you sit up and smile, and Cameron certainly did this for me with Red Knight. This is an exceptional novel. Well written, well plotted, with a unique magic system, a well-drawn world of epic fantasy, great action and excellent characterisation. I was not so sure off the mark. Although obviously well written — Cameron writes like a pro and his background in historical fiction has given him clarity and precision — there were some things that put me off. These were in the realm of structure and artistic choices, rather than craft. One was the high level of detail in armour description. I have a limited tolerance for technical descriptions that bog down the narrative flow, like extensive descriptions of sniper rifles in thrillers for example. Although I respected his obvious detailed knowledge of period armour, this was initially a negative for me. The second thing was Cameron’s penchant for writing in vignettes. There was short scene after short scene — very short, some only a page or less — most of which introduced new character after new character. Here Cameron had to work through the difficulty of the writer who draws a broad canvass for a series — how to introduce the necessary cast of characters without slowing down the story and confusing the reader. Well, for me it really did slow the story down, at least at the start. By the time I was fifty pages in, I had accepted the detailed descriptions of armour as necessary for the piece. This was epic fantasy, with knights in armour and the whole panoply of attendant squires, men-at-arms, crossbowmen, archers etc, and the descriptions and specialised vocabulary ultimately added to the sharpness with which the world is drawn. My initial hesitation on this front was probably due to the fact that I am not typically an epic fantasy reader — I tend toward heroic fantasy in unique and completely non-medieval settings. I was probably about one third of the way through the book by the time I had adapted to the continuing vignettes and was comfortable with the large array of characters. By this stage I was completely hooked on the story. 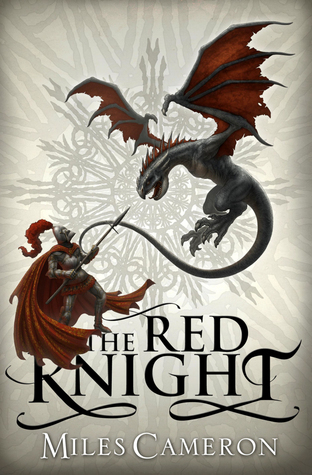 If you love fantasy, and particularly if you like epic fantasy, check out The Red Knight. I, for one, am really looking forward to the rest of this series. I haven’t been this excited by a new fantasy writer in a long time. HERE BE SPOILERS! (If you want to read the book, stop reading now:)). I love magic – hey that’s why I write fantasy – and I cannot remember the last time I enjoyed a new magic system as much. I really enjoyed the subsidiary characters, particularly the mage Harmodius. The broader story, and the array of Wild creatures, was also very well done, with a mix of the new and familiar. One thing I did think could have been stronger was the portrayal of Thorn. This man was supposed to have once been a magical genius, yet he reacted to like an angry adolescent to any provocation, and was ultimately revealed to have been manipulated by forces unknown. I would have liked more complexity in Thorn. I do like my villains to be complex — something I probably got from reading so many Gemmell novels. Now there was an author who knew how to write shades of grey into both his protagonists, and antagonists. I hope everyone had a great Christmas, and Santa brought you what you wanted. Heading toward the end of the year, I thought I would reflect on the most interesting Fantasy of the Year. My overall favourite read would have to go to Ryhming Rings, the surprise posthumous publication by my all-time favourite writer David Gemmell, but here I’m talking about Fantasy novels particularly. I did not quite know what to make of this book, since on the face of it, it featured many of the things that usually are deal-breakers for me, but I still come back to the novel as my most unusual Fantasy read of the year. The first novel by by Peter Newman, called The Vagrant. The Vagrant was slightly offbeat, but overall a nicely worked piece. The post-apocalyptic setting is well imagined, and it’s nice to see someone successfully pulling off a cross-genre mix of horror and SF, something I have a bit of a soft spot for. The writing is good, but what had me gritting my teeth from the very outset was the use of present tense, somewhat of a pet hate of mine. And to make it even more of a challenge, the central protagonist is mute — yep, he doesn’t speak through the entire novel. Not only is the main character silent, but he is outside the point-of-view. The book is written in an omniscient viewpoint. I’ve got no particular problem with omniscient, but in that case I really look for the dialogue to express the inner world of the character. In this case that personality is successfully portrayed through the Vagrant’s heroic actions and his consistent integrity, which I enjoyed. I don’t typically go for anti-heroes, so that was a big plus for me. The world is beautifully crafted, imaginative, and original. I was drawn through the story as much by the quest of the Vagrant to exit the cursed badlands where his journey begins, as by the vast amount of unknown backstory that is slowly drip-fed to the reader. 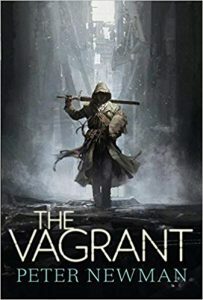 For me though, a reader who loves being hooked into character, the absence of the Vagrants PoV really hampered my ultimate enjoyment of the novel. Hey, but that’s just me. Given the fact that the Vagrant has only his non-verbal interactions and his actions in response to challenges to demonstrate his character, Newman does of great job of creating sympathy. 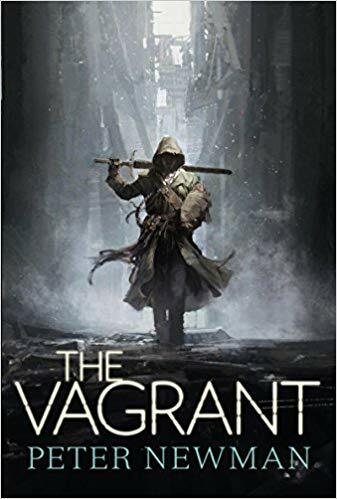 I think one of the core vehicles for this is the fact that the Vagrant is the guardian and primary carer for a tiny infant that spends most of the book hidden away in his coat (don’t worry that’s no spoiler! You learn that pretty much on page 1). Having him obviously caring and protecting an defenseless infant goes a long way to creating that sympathetic link between writer and reader. “If you’re after a fast paced, complex adventure with detailed world building, politics and characters, then The Calvanni may be just what you’re looking for. The Calvanni is set upon the world of Yos – a world where all metal is magical and cannot be forged. The weapons and armour must be made from natural materials and special ceramics – a nice point of difference from other novels I’ve read. The magic system has been well thought out and for those who like a lot magic in their reading, this book has plenty and some excellent battle sequences. When the story opens the reader is plunged into the scene dealing with the assassination of the Sarlord of Athria. The depth of the political intrigue and old rivalries within the novel are quickly revealed. McMahon has also created a world with complex social and religious classes and many unusual animals. This detail is one of the greatest strengths of The Calvanni, yet it may also be an initial obstacle to reading enjoyment for some. There is an array of unique terminology for this world within the novel. Fortunately, there is a glossary at the beginning of the book, which many may find useful. I actually enjoyed all the new terms and creatures that McMahon adds to the world of Yos – for me it added to its sense of authenticity. If you find this initially difficult, then persevere because your patience will reward you with a great read. The pace and the construction of the story are such that you just keep reading and pick up the terminology, or what is implied by it quickly. On first glance the cover of The Calvanni seemed to me to be more akin to the type of illustration one would see on the cover of an romance novel that masquerades as epic fantasy – Don’t let that fool you because this is a high fantasy with some of the most original and intricate world building I have read in long while. 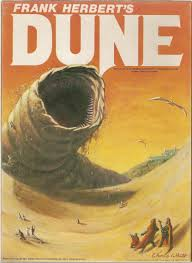 I recently set myself the task of reading all of the Frank Herbert Dune books, and the additional prequels written by Kevin J Anderson and Brian Herbert. Fourteen books in all. What spurred me on to do this was coming across the first set of Dune prequels in a second-hand bookstore and reading them for the first time. These prequels — House Atreides, House Harkonnen and House Corrino — sustained my interest and re-ignited my enthusiasm for the Dune Universe. So here I go. This is not a formal review — I don’t pretend to be a SF critic — this is just me with a journal, sitting in a coffee shop, writing down my thoughts after reading the book; as insightful, incomplete or tangential as they were . . .
Herbert’s world has amazing scope, and its creation is an incredible achievement. Re-reading this book after so many years was a different experience. I can see now how frustrated I would have been as a younger reader at the lack of action. As an older reader, I could appreciate Herbert’s writing much more. I would have to say though, for all the confusing wordage of his pre-chapter ‘wisdom’ excerpts and his in-prose philosophical insertions — which occupy much of the prose and dialogue — I have taken away no powerful insights. For me there was no true transfer of wisdom, no higher knowledge. At worst I felt the Herbert was sewing confusion and word-games that sounded profound, but which he himself had no personal stake in. His own beliefs and thoughts remain unstated. Basically, these extended sections of dialogue were literary smoke and mirrors. I concluded that this is in effect a form of delayed resolution to draw the reader on, where many questions are raised, yet no conclusion is ever delivered. And no truth. The main focus of Dune’s narrative is the inner experience and transformation of Paul. I was impatient with this when I first read Dune. On this second read, may years later, I appreciated Herbert’s prose expression, yet felt he failed to convey a true transformative experience, falling back into word-puzzles and a philosophical mish-mass that implied significance without delivering. The fact of genetic memory is a central premise of this world. I cannot accept this as a credible basis. This does not make sense to me from a scientific point of view. Herbert’s novel implies telepathy through contact in the spice ritual that creates the Reverend Mothers, yet the mechanism or actuality is unclear. The idea of a Mentat is sound, yet Thufur fails to convince me as a character. We are told he is a master assassin and mentat, yet he never actually shows us anything to convince us of this. And believe me — I wanted to believe it! I wanted to see it! The Bene Gesserit are done well – you can see directly how their training gives them advantages. You can credit this, and it is shown directly through Jessica as a character. The Bene Tleilaxu are vaguely presented in this first book, but intriguing. All up I enjoyed the return to the world of Dune, and enjoyed Herbert’s prose. He has created a in-depth and convincing world that has remarkable texture and is a pleasure to visit.